Angels are popular decorations for Christmas, whether around the home or on the Christmas tree. An angel is often the crowning glory of a decorated Christmas tree. There are many items from which to craft an angel tree topper. Paper is an inexpensive material to use for this craft. 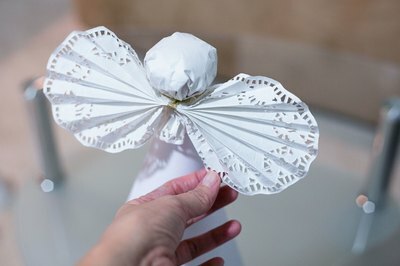 Yet, a homemade paper angel can be as elegant as one crafted from more expensive items. 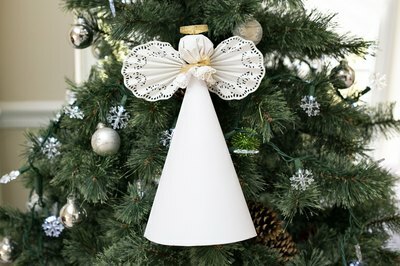 Make a paper angel Christmas tree topper for your own tree or to give as a gift. 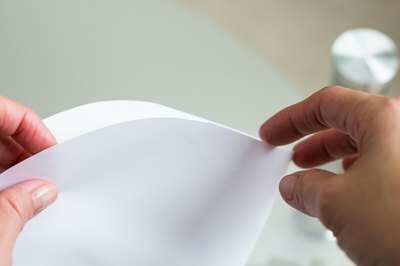 Place a 20-inch round baking sheet on a sheet of sturdy white paper. Trace around the pan with a pencil. Use decorative craft scissors to cut out the circle. Fold the 20-inch circle in half. Roll the folded half-circle to form a cone. Place clear tape along the seam to hold the cone shape in place to form the angel's body. Assemble the angel with the taped seam at the back of the angel. Place a fist-sized ball of cotton stuffing in the center of a 10-inch white paper doily. Gather the doily around the cotton to form the angel's head. Twist the doily to form a neck under the head. Tie an 8-inch piece of gold ribbon around the neck to hold the cotton in place. Let the ends hang loosely to use in step 5. Spread craft glue around the point of the body cone. Slip the head over the glue-covered cone point, letting the leftovers of the doily hang down over the angel body to look like a shawl. Keep the ribbon ends at the front of the angel body. 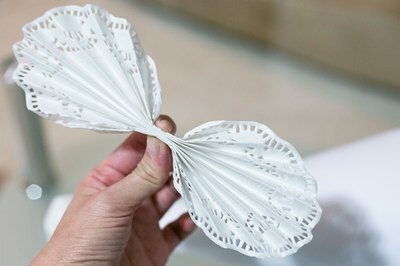 Gather a 10-inch white paper doily together at the center with a slight fan-fold effect. Tie an 8-inch piece of gold ribbon around the gathered center. 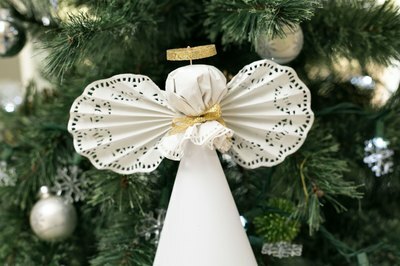 Place the gathered doily at the center back of the angel's neck to form wings. Tie the ends of the gold ribbon around the neck from the back to the front. Form a bow with the pieces of ribbon from step 3 and this step. Arrange the wings at the back of the angel as desired. Place small pieces of tape at the center of the wings to hold the piece onto the angel's shawl. Finish the angel with gold embellishments. Glue a circle of gold ribbon to the top of the angel's head. Spread glue along the edges of the angel body, the shawl and the wings. Sprinkle gold glitter in the gold. Slip the finished angel over the top of a decorated Christmas tree.